There’s a general consensus that early childhood education programs are a worthwhile investment in the United States for participants, their families, and the public at large. By nurturing both cognitive and noncognitive skills, a high-quality preschool education boasts impressive long-term benefits such as increased high-school graduation rates, lower crime rates, higher earnings, and better health outcomes. What’s more, when monetized, the benefits overshadow the costs of these programs and even accelerate economic growth. While there’s agreement on the benefits of pre-Kindergarten, there is much less of a consensus on what it should look like. Research shows that the quality of a program’s structure—student-to-teacher ratios, class size, or teacher qualifications, for example—and process—things such as classroom interactions, parental involvement, or instructional materials—certainly matter. Yet questions still remain about how preschool can help reduce the fadeout of cognitive skills and instead sustain the gains. These typical considerations, though critical, leave out another factor: classroom diversity. A recent report by Jeanne L. Reid and Sharon Lynn Kagan of the National Center for Children and Families at Columbia University, Michael Hilton of the Poverty and Race Research Action Council, and Halley Potter of The Century Foundation tackles exactly this issue. The report not only surveys the limited research that connects socioeconomic and racial and ethnic diversity in early childhood classrooms to educational outcomes, but also highlights the importance of thinking about preschool classroom diversity as a contributor to the quality of a preschool education. Researchers usually focus primarily on understanding how classrooms’ socioeconomic and racial and ethnic composition affects educational outcomes for students in Kindergarten through 12th grade. Through these studies, scholars have revealed that more socioeconomically diverse and more racially and ethnically diverse schools promote greater student achievement and provide a number of other benefits throughout those primary and secondary educational years. According to this report, though, there are substantially fewer studies that look at the impacts of preschool classroom composition. One such study (co-authored by Reid and Douglas D. Ready of Columbia University) highlighted in the report observed 2,966 children in 704 pre-K classrooms and found that the children in classrooms with a middle-to-high average socioeconomic status—in short, classrooms that are more economically diverse—learned more receptive language, expressive language, and math skills than their counterparts in lower average socioeconomic status classrooms independent of the racial and ethnic diversity of their classrooms. That same study found that more racial and ethnic diversity in preschool classrooms was associated with higher language development outcomes. Reid, Kagan, Hilton, and Potter in their report explain that the improved outcomes of students in socioeconomically and racially and ethnically diverse classrooms are likely due to peer effects. Children from higher-income backgrounds often enter pre-K more prepared than their lower-income peers. Through interactions, these higher-skilled preschoolers may help their lower-income peers learn. Though more research is needed to understand the role that diversity plays in preschool outcomes, the reality is that preschool programs in the United States have a long way to go to becoming truly diversified classrooms. 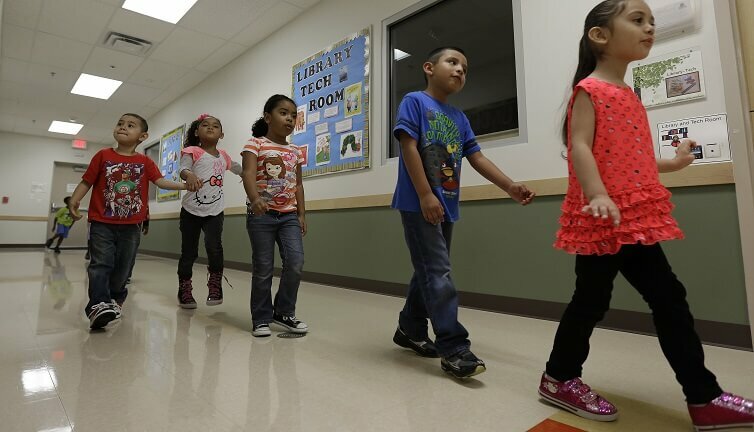 The four co-authors of the report note that most children in publicly available preschool today are segregated across income and race, with children from higher-income and non-Hispanic families most likely to enroll in the first place. To make matters worse, the data show that low-income children are often disproportionately enrolled into low-quality pre-K.
To address socioeconomic and racial and ethnic diversity concerns, researchers and policymakers have proposed implementing universal pre-K programs over ones targeted at disadvantaged children. Policies that address rising neighborhood segregation or local zoning policies also can help increase access to high-quality early childhood education and the economic diversification of classrooms starting in preschool. Moving forward, researchers and policymakers alike should incorporate concerns over diversity in preschool programs into their frameworks. After all, if the education of more productive adults begins in preschool, then equity should be integrated right from the start to ensure the future economic growth and productivity of the U.S. economy is as robust as possible.